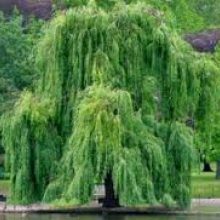 @turningreen is new to me…as I’m reading blogs and comments, every now and then I read a comment someone has made which sends me over to their page…this girl got my attention immediately and I read several of her posts. She is hilarious and has a way with the word…if none other, you must read the post about buying her able bodied daughter crutches…just because. 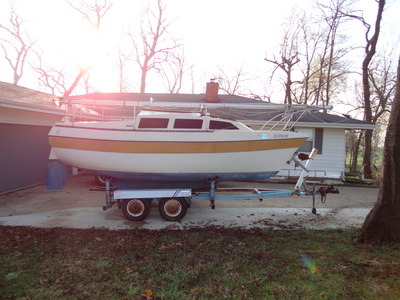 Apparently there are very few things the same as the smaller sailboat as far as getting things ready to launch 🙂 This one is going to take some time to clean….Dave wants to paint the gold stripe…the cabin needs some cleanin’, it has a sink and a potty..which makes mama very happy. 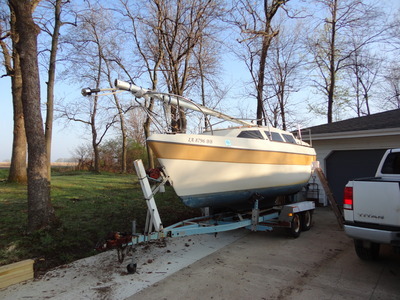 Now…we need to get the pontoon and the smaller sailboat sold. 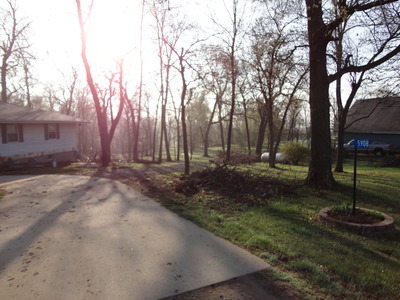 We had a tree trimmer out Friday and Saturday to work on the two properties. I swear it looked like a huge storm had gone thru when I got home from work yesterday..I took these this morning after a lot of front yard cleanup. 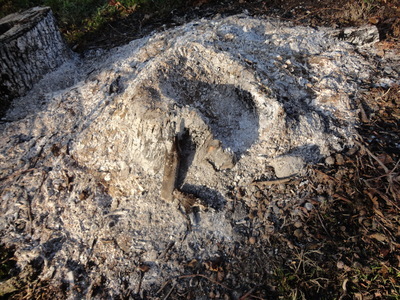 We had a stump close to the house where I burned a lot of brush yesterday…trying to burn it out because he’s going to put a deck across this side of the house once the siders are thru. Roomba is working on the kitchen and dining room, Frannie and I took a short walk…My xanga post is almost done…I’m on my way outside now to pickup tree limbs. 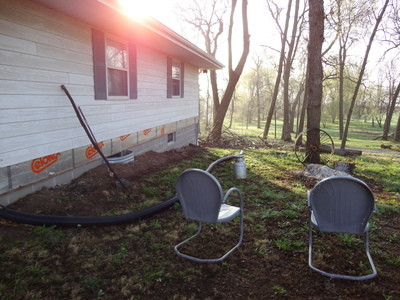 @skanickadee – yes…the current house is a ranch and about double the size…once I integrated mom and dad’s stuff, I really needed the bigger house..plus this one doesn’t have steps…much better for my knees…and his too, actually. They are both on a little over 2 acres and one house is about 100 yards from the other…I’m very happy in the new house!! !I really wish you and Craig could take a little drive and visit us….oh…and bring a Chicago Pizza with you 🙂 If it ever strikes you to take a little trip, just call, we will always be ready…we have a guest room or a hotel not far away!!!!! Lovely sailboat. Craig has always wanted to have a sailboat but it is so expensive around here to keep one (plus I have zero interest in being on the water). Have a great time with it!It really does make quite a difference when you have the trees trimmed. 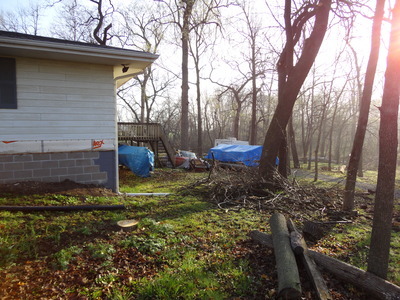 I hope you like how it looks once all the leaves come in.So I have a question. I’m guessing you traded houses. I was wondering why. Is this one bigger or smaller? Was it weird to move from the other house to this one? Thank you so much for your kind comments and this fabulous mention! I am out of town and on the fly but will be back to read and get to know you soon!